Eric Schrag (left) and Kelly Merrell both spent time at Google I/O getting accustomed to wearing and using Google Glass eyewear. A software engineer for Comcast got his early version of Google Glass last weekend, grabbed his bike and shot video of his ride across the Golden Gate Bridge. Despite his enthusiasm, Schrag said he's still trying to figure out how Glass, the technology that Google has built in to futuristic-looking eyeglasses, will fit into his life. Similar sentiments were expressed by quite a few people who were trying out Glass while attending Google I/O, Google's annual developer conference, in San Francisco this week. Over the past month, Google has been issuing early versions of Glass to developers and enthusiasts who signed up to buy the prototypes for $1,500 during last year's Google I/O conference. Now the company is starting to get Glass devices out to a widening base of early users. Eric Schmidt, Google's executive chairman, said this spring that it could be about a year before a version of Glass is ready to officially ship. That makes Google I/O the perfect spot for new users to try out Glass in a tech-friendly environment. People new to wearing computers on their faces are walking around the conference center, exaggeratedly nodding their heads to activate the devices, and taking pictures and video. They're also reading email, checking weather reports and reviewing flight schedules -- all without taking their smartphones out of their pockets. "I've had this sense of freedom," said Kelly Merrell, director of Android development for Mercury Intermedia. "I realized that with all the notifications I get, I had to keep pulling my phone out and checking it. Now it's no longer an issue. It's made me feel less reliant on my phone." Chris Liu, a software engineer at Cisco, has been using his new Glass device since last Sunday. He said he's never worn eyeglasses before so just the sensation of having something on his face is strange to him. 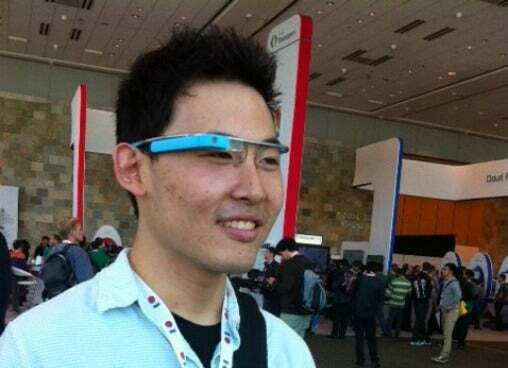 Chris Liu wearing his Glass device at Google I/O. He's adjusting quickly; he used Glass to record the keynote address and various sessions at Google I/O. He also used Glass to join a Google+ Hangout. The other people in the Hangout couldn't see Liu, but they could see what he was seeing through Glass. "It's pretty cool if you're at an event like this," said Liu. "People want to see what you're seeing. It was great." Rachel Roumeliotis, a senior editor at O'Reilly Media, also started using the computerized eyewear this week and has been trying out the technology at the conference. She said she feels comfortable with the system. She has asked Glass for directions to places in San Francisco, and has also used it to retrieve messages and take videos in her hotel. Rachel Roumeliotis at Google I/O. She acknowledged that she has gotten some strange looks from people around the city, but that hasn't affected her experience. "I can tell people are looking at me, but it doesn't bother me," she said. Glass is designed to take photos and video, send and receive email, and even post comments and pictures on social media sites. The glasses are set up to be controlled by voice, gesture and touch. At this week's developers conference, Google focused on trying to foster the growth and development of the Glass app ecosystem, noting that Facebook, Twitter, CNN, the New York Times and Elle magazine all have created software that it calls "Glassware." Some members of the U.S. Congress are concerned about Google Glass and privacy. On the second day of Google I/O, the bipartisan privacy caucus sent a letter to Google asking questions about the kind of data stored in Glass.